From the moment you step in this quaint and cozy cabin you will fall in love! You could describe it as "small, but cute" and perfect for a romantic getaway! 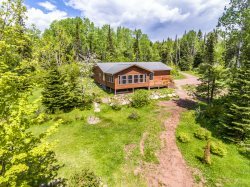 Located just steps away from a beautiful cobblestone beach along the shores of Lake Superior, this setting is picturesque and sure to inspire. Here you are just a short drive away from many area attractions. Temperance River State Park is practically in your back yard with miles of hiking trails and beautiful waterfalls. Also nearby you will find mountain biking trails, scenic overlooks, and much, much more! Hungry for a bite to eat? Hop in the car and head up the shore and check out some of the great resort restaurants in Lutsen, including the Bluefin Grille at Bluefin Bay, Lakeside Dining Room and Poplar River Pub at Lutsen Resort, Moguls Grille & Tap Room at Caribou Highlands Resort, and Papa Charlie's Grill & Tavern at Eagle Ridge Resort. Each features live music from popular local artists throughout the summer. Of course, if your goal is to get away from it all and just relax, you've come to the right place. Sit out on your deck and look out over Lake Superior. Listen to the waves roll in on the cobblestone beach. Lie out on the beach at night and look for shooting stars. Once you're here, you'll never want to leave. This is a seasonal cabin open May through October. Pets are welcome with prior approval with an additional fee. 2 pet maximum. The location was great -- could not have been better. The space was well-organized and clean. We appreciated the water cooler. Reflections 2 is an awesome place to stay! We enjoyed our time there again this year and intend to revisit next year, too. Thank you to the owners of this property for allowing dogs! This is currently our favorite place to stay on Lake Superior! I liked the lake/cabin house. It was cozy and felt like home. My only suggestion would be if the home had an ottoman between the two chairs in the living room area. Otherwise, we loved the property! Everything was just perfect. Location, cabin, service, everything !!!! This is our second time renting Superior Reflections and we love it! The cabin is perfect and it's so nice to have a bbq grill and cookware there for guests to use. It's always clean and the location is amazing! It's also great that dogs are allowed! Location is great. Cabin was fairly comfortable. Ottomans would be a good idea for the living area. Our first stay in Reflections 2. Previously stayed in Reflections 1. We like both of them and the location right on the beach is great. Love listening to the waves lapping or crashing at night. We didn't need our usual noise machine. Only one small complaint, the lighting in the ceiling fan was very poor. We like light! Also, though the easy chairs are comfortable, we think a sofa would be better. In case you want to take separate naps. (maybe one snores) Otherwise, the cabin is great and hopefully next time the weather will be more cooperative. Cabin was neat, clean, and well supplied with utensils, towels, etc. Location on the beach is certainly a highlight.